Prof. Thandi you have been working on diaspora and development linkages. How do you correlate diaspora with development in the global context? Although some of us have been working on the impact of remittances on sending societies, it is only in the last decade or so with the work of some American academics such as Jennifer Brinkerhoff, Devesh Kapur and Manuel Orozco among several others we now have a more nuanced framework for looking at the Diaspora-Development nexus. I see this as a result of the merging of migration and diaspora studies. So nowadays the focus in not purely on remittances – all forms of financial transfers – for instance direct investment, portfolio investment, purchase of special diaspora bonds, philanthropic flows, have begun to be captured. In addition diasporas can make a contribution in terms of fostering entrepreneurship and innovation, enable technology and knowledge transfer, as well as transferring other intangible assets. All these are expected to contribute positively to homeland development and the problem then becomes one of harnessing and mobilizing these latent resources to get the best out of the diaspora. This diaspora-development nexus mantra spread quickly across the globe, among governments and global development and financial institutions and provided a welcome correction to the earlier perspective which viewed diasporas as liabilities and Janus-faced, which contribute, for example towards generating ethnic conflict and separatism and compromising national sovereignty. However whilst the diaspora’s potential is definitely there, only some countries have been successful in mobilizing and realizing the benefits – largely through implementing innovative engagement policies which built trust between the diaspora and homeland governments. But of course, many governments have failed in their engagement- largely because they have not taken their diaspora seriously or only remained rhetorically supportive. At other times, lack of supporting infrastructure and investments, internal political instability and ambivalence in policies in the homeland means diaspora remains disinterested. What are the major intervening variables that influence diaspora’s participation in the development process back home? Do you think India has explored the potential of diaspora for development? This is a difficult question to answer as no diaspora is the same in its emergence and neither do all diasporas have the ability or capacity to contribute to the development process back home. I suppose it all depends on the characteristics of the diaspora -its length of settlement overseas, reasons for migration, education and skill set, demographic make-up and the size of the business class. Further, there are different types of diasporas. Generally we would expect a close relationship between the wealth of the diaspora and its capacity to contribute. But some diasporas emerge as a result of political upheavals, for example through forced migration or refugee status and it may take several generation to accumulate wealth. Others may be technical diasporas, for example as a result of brain drain where people have left voluntarily to improve their living standard overseas. There may be diasporas which remain transitory or ‘guest workers’ abroad as they don’t have permanent residency or not entitled to it. The Indian diaspora in the Gulf States exhibits some of these characteristics. Some diasporas emerged a long time ago and over time lost contact with their homeland –India’s PIOs would fall into that category. These different types of diasporas can exist for a single country, so for example, we sometimes speak of India’s many diasporas. All of these have an impact on disporas’ homeward orientation. If we consider the characteristics of the Indian diaspora, there is a general distinction made between the ‘old’ and ‘new’ diaspora – the ‘old’ residing largely in countries which were under British control or another European power and are generally not part of the developed world. The ‘new’ diaspora is a post-independence phenomenon, especially gathering pace from the mid-1980s with the increased brain drain and rise of the IT sector, and is largely to ‘rich countries of North America, Europe or Australasia. As India only began to re-connect with and re-discover its old diaspora in the last 20 years or so, it’s potential to contribute to India remains limited and untapped at present. That is not to say that within the ‘old’ diaspora communities there aren’t very wealthy and entrepreneurial people who have enormous ability to contribute.In this context, for example, the Mauritius-India connection is an interesting one, even if much of foreign investment coming from Mauritius may be due to recycling or what is referred to as round-tripping. Unfortunately the focus of government policies has been on the ‘new’diaspora, especially the professional groups in North America who have contributed in the IT, health, education, transport, tourism and hospitality sectors. So what are the major policy challenges to engage diaspora in development in India in general and Punjab in particular? India’s engagement with the diaspora, through a series of long-overdue initiatives and annual PBDs, has finally begun to yield results and the Indian diaspora is contributing in a number of positive ways and greatly contributing to India’s foreign exchange reserves. But more needs to be done especially in the area of NRI investment which has been, frankly, quite pathetic as percentage of total FDI coming to India since liberalisation began. Some of the successes have to be attributed to the devolving of greater powers to individual states as they, rather than central government, have the potential to develop a more constructive engagement. States such as Gujarat, Andhra Pradesh, Karnataka and Kerala have demonstrated this to a certain extent but more effort is required. Sometimes overseas Indians may show more commitment and patriotism to their native state rather than India as a whole. More devolved power to states and perhaps even encouraging greater competition among themmay act as a spurfor more FDI in general but also greater NRI investment.There are some lessons here from China’s success in attracting FDI. But we need to careful as not all states are equally resource endowed and spatial inequalities may increase further. I am afraid to say Punjab – a state which I know well and work on - has proved to be the exception – despite its 100 plus years old diaspora. The reasons for the abject failure of Punjab to engage with its diaspora for development at the official level are complex – due to characteristics of the diaspora, its length of settlement abroad, and in more recent times the role of political factors which have alienated large sections of the diaspora from state governments. I suppose the events of 1984 - Operation Bluestar and the November anti Sikh violence in Delhi - were critical in creating that alienation and a prolonged militancy movement coupled with strong perceptions of bad governance and economic mismanagement do not help matters. This alienation has resulted in a huge trust deficit, so potential Punjabi diaspora investors shy away. However, having said that, in terms of private family remittances and in terms of philanthropic giving, Punjabis abroad still care and are generous in helping their kinfolk back home. There is a dire need for the Punjab government and for overseas Punjabis themselves to focus on this and engage in a period of deep introspection – otherwise Punjab will continue to decline in the league table of Indian states and potential contribution by the Punjabi diaspora will remain a lost opportunity. How sustainable is the diaspora lead development, particularly in the case of Punjab? The most important forms of diaspora finance entering Punjab are family remittances and philanthropic giving. My feeling is that remittances will continue to flow in as long as overseas migration continues to occur – we know that Punjab has a deeply embedded migration culture. We also know that it is often the new migrants, who happen to be single and on a work permit, who are likely to remit the most. But there are also many joint families with some members settled abroad and the migrants abroad are under a moral obligation to support those back home. So remittances, the mainstay of livelihoods in many villages in Punjab, are likely to continue for the foreseeable future. Collectively, these family remittances will continue to have significant impact on development. I am less certain about philanthropic giving. Philanthropic giving, of course, comes in different forms - religious donations, building of charitable hospitals and schools, regular medical camps for eye surgery or cancer screening or community development projects such as village modernisation. I suspect the community development oriented projects - quite popular over the last decade or so - may decline as first generation migrants, with their ‘homing desire’, disappear and their second and third generation children lose contact with their homeland. Also these initiatives were taken by visionary social entrepreneurs who are now rather thin on the ground. Already the villages that were modernized in the first phase – such as Kharoudi and Palahi where I first did fieldwork over a decade ago, are crying out for maintenance work. But faith-based giving and humanitarian aid will continue and remain strong. For an outsider, both Punjabi and Sikh diaspora sounds the same. Do you think there is any difference? If so, how do they reflect in the diaspora as well as in the domestic engagement? Yes I am not surprised there is some confusion and both are often equated to be the same. I would say the only commonality is their regional Punjabi identity and beyond that there are many differences. In a way Punjabi diaspora can be seen as a generic and all-inclusive umbrella term which captures the regional identity of everyone of Punjabi heritage. This implies that there are different types of Punjabis and Punjabi diasporas – Sikh, Hindu, Dalit and Christian for instance. Even among some of the seemingly homogenous ‘religious’ categories there are differences which may be related to their occupational trade eg among Sikhs (Jat, Ramgarhia, Ravidassia) and among Dalits (Ravidassia, Valmiki etc) but many scholars tend to lump them up for convenience. More experienced scholars would specify which religious community their discussion of Punjabi diaspora refers to. Sikh diaspora on the other hand is specific to Sikh Punjabis only, although as I have just stated, it is also a heterogeneous group. Since historically the Sikhs migrated much earlier and in greater numbers than other Punjabi communities and were largely of farming background, they form by far the most dominant component of the Punjabi diaspora – hence the equation. In the diaspora too, there is fragmentation among Punjabis and it is unfortunate that their shared Punjabi identity tends to be overshadowed by their religious identities. In countries like UK and Canada, the largest home to overseas Punjabis, Sikhs, Hindus and Dalits have established their own religious, political and cultural organisations. These have been encouraged by multicultural policies with their emphasis on celebrating difference as well as by discourses on identity. As a consequence there is lack of dialogue between Punjabi communities which can sometimes lead to tension between them. This fragmentation and polarisation is unfortunately also reflected in the forms of engagement with Punjab. For instance philanthropy tends to be entirely based on religious identity. Punjab government initiatives, designed to foster greater diaspora engagement, especially given the way in which they are delivered in the diaspora, do tend to reflect a Sikh bias, excluding other Punjabi minority communities. You have worked on issues of diaspora finance, which broadly includes areas such as philanthropy, remittances and investments. In which of these three areas do you find diaspora engagement is strong in case of Punjabi diaspora and why? Without doubt the role of family remittances remains the most visible contribution by the diaspora. Further, unlike previously, where their impact was most visible in the central districts (the doaba sub-region), as out-migration also spread toother sub-regions of Punjab over the last 30 years or so, the impact of remittances is also visible there now. There seems to be strong correlation between recent migration and remittance flows and this can be seen in the increase in remittance flows from new areas of Punjabi migration such as the Gulf States, Southern Europe, particularly Italy, Greece and Spain. There is anecdotal evidence to suggest that families who migrated over 50 years ago have started to disinvest in Punjab, for example, selling their ancestral land or land that had been purchased with remittances sent in the earlier period. It is therefore not surprising that the biggest grievance of overseas Punjabis, especially Sikhs, is related to difficulties they face in establishing their legal, ownership, right over landed property. Family feuds and litigation are symptoms of this. Diaspora philanthropy has a long history in Punjab but has grown immensely in the last two decades with so many innovative initiatives by individuals, families and organisations. Although religious philanthropy remains big and will probably remain so, there have many other secular type initiatives which have greatly improved the well-being of all people, whether through provision of educational institutions, hospitals and mobile clinics or village level development. My feeling is that although religious philanthropy still remains buoyant, other types of philanthropy seems to have ebbed. For example the highly successful village modernisation programme led by non-resident Punjabis seems to have slowed and some of the reasons for this include decline in interest in the diaspora and also inability of the debt-ridden Punjab government to allocate sufficient matching funding - sometimes even double or triple amounts –to add to philanthropic funds raised in the diaspora. It is a real shame because this programme had transformed the lives of so many village people. In terms of other forms of diaspora finance, bank deposits are perhaps the biggest component but these tend to be part of family or household remittances. The biggest failure has been the lack of employment-generating private investment by overseas Punjabis, despite the existence of a vibrant, wealthy and growing business class in the diaspora. There are many reasons for this lack of investment and failures in diaspora engagement as I have pointed out in some of my research papers. Do you suggest any specific policy measures to increase diaspora’s economic participation in the home state? Yes there are a range of policies which can be tried but the whole engagement process needs to have clearly defined goals – what is it that the Punjab government wants out of its diaspora? Then there needs to some kind of inventory development to assess the diaspora’s assets and capabilities. This may then need to be followed by working on trust or confidence building measures and finally developing an outreach policy package that would be mutually beneficial– so it is a very tall order and I am not sure Punjab governments have thought about such a systematic approach towards engagement. There is also the importance of learning from other countries which have effectively and successfully engaged their diaspora. There are several examples of these in Latin America and also from some states in India but all successful policies involve a pro-active and strong supportive role for the homeland government. Further, given the heterogeneous nature of the Punjabi diaspora, one size fits all policies will not do – it has to be multi-pronged engaging all the Punjabi communities. As I already argued, unfortunately there are severe limitations – lack of political will and a huge trust deficit quickly come to mind - and the Punjab government needs to work hard if it is to realize the potential offered by an effective diaspora engagement. How do you rate the success of Punjabi diaspora? What sociological reasons you attribute to their success in many countries? This is an interesting but complex question and many people have provided different explanations for immigrant success. So in a way Punjabi diaspora success merely mirrors the success achieved by other immigrant groups in their new adopted homes. One popular explanation argues that ‘host societies’ tend to discriminate against immigrant communities and hence find it difficult to get employment positions or promotions whether in the public or private sector. They are therefore pushed towards self-employment. This is in many ways a reactive model but success is achieved via self-employment. Others argue that immigrant groups take advantage of new opportunity structures, especially those offered by their own community – whether in food and greengrocery, garments, travel and property services. In both instances, since they are working for their own businesses, they work all the hours and make it a success. There are thousands of such small scale businessmen, largely in retailing or providing other ‘ethnic good and services’ and therefore largely selling to their co-ethnics. Some of them have grown into medium and even large scale businesses and have shaken off their ethnic label to sell to the mainstream community. Others, especially the more educated, have done well in the professions – law, medicine, engineering, accountancy etc. Without oversimplifying it, I would say there have been two important routes to entrepreneurial success: hard graft with total commitment and making the best of education facilities available in the ‘host’ country. Economic and business success, enabling upward social mobility, has only been possible because Punjabis, like other Indians in Britain, have taken full advantage of school and university education. The university education participation rates among students of Indian heritage have been consistently and disproportionately higher than among their peer groups. However we must caution against generalisation here – most Punjabis (and other Indians) are not in business or in the professions and are in fact largely unskilled and semi-skilled and just managing to earn a decent living. Punjabi migrants, who are living outside the rich countries of North America and Europe, can often be living highly marginalised lives and can have a very vulnerable and precarious status as recent events in many Middle East countries have shown. Another example of this precarious existence is that of Punjabi migrants in the Philippines, with several hundred of them ending up being killed. So undoubtedly Punjabis have made a great success wherever they have settled, but this success is very uneven across the diaspora and there is a significant underbelly which we hardly speak about. How does the political, religious and social conflict back home influence the diaspora abroad and vice versa? How often do you find there are cases of religious factionalism, runway brides, dowry cases that makes the diaspora- home relations bitter? Does it affect their engagement with the home state? I would say that there has always been a strong connection between political, religious and social developments in Punjab and India and Punjabi diaspora. These connections have always been multi-directional – homeland events affecting diaspora and diaspora events affecting homeland. In terms of politics, Ghadar movement for instance - whose 100th anniversary we have been celebrating his year –is one example where there was an attempt by Punjabis (and Indian diaspora) based in California (USA) and Canada to free India of British raj. In Britain, Punjabis and other Indians always responded to political developments back home - for example during the Indo-Pak or Indo-China Wars and of course we saw sections of the Sikh diaspora supporting the Khalistan movement, which after all had its roots in Punjab despite some misunderstandings. In fact with globalisation, rise of internet and social media, political networks have strengthenedeven further. In terms of religion, the Punjabi communities and their religious institutions are closely linked to those in Punjab or India. Many religious leaders, musicians and preachers visit the diaspora. A huge number of Punjabis come to Punjab and India for religious pilgrimages and any religious conflict in the homeland quickly transmits to the diaspora. We saw that vividly after Operation Bluestar in 1984, in the November 1984 anti-Sikh violence in Delhi, after Mrs Gandhi’s assassination by her Sikh bodyguards. I remember reading about the two days of violence and carnage in Punjab, especially in Jullundur, when the Ravidassia religious leader was shot in Vienna by some alleged Sikh militants. And there are many other examples of how religious conflict in the homeland or the diaspora gets quickly transmitted home or abroad. In terms of social factors, again there are direct connections, whether it is in terms of musical trends, fashion or social attitudes, for instance, about caste. The rise of Bhangra music in Britain influences Punjabi music back home but Punjabi folk music also continues to re-invigorate Bhangra music overseas. The institution of caste and casteist attitudes has been reproduced in the diaspora and tensions in the diaspora or at home transmit quickly and widely. For instance the rise of the Punjabi dalit voice in Britain is partly due to British multiculturalism which enables dalits to assert their own religious identity, partly to rise of dalit consciousness and politics in India and partly to persistence of casteist attitudes. In a way Indian dalit political discourses have been transplanted in Britain where dalit organisations have lobbied British Parliament to include caste discrimination in the Equalities Bill. This has raised social tensions with Hindus and Sikhs arguing against the inclusion. In recent times the Punjabi diaspora had been instrumental in financing the political parties in a big way against the established political parties. For example the Aam Admi Party mobilised very strong diaspora support. Do you think the Punjabi diaspora is keen in politics of the home state? As I stated in the previous answer there have always been strong political connections between the diaspora and homeland. This was seen in the Ghadar movement and the Khalistan movement. All Punjab based parties (as is the case for India-level ones) have overseas branches and funds are raised by visiting politicians or for specific issues. But I have been recently arguing that in the post-1984 period, the established political parties have lost credibility with diaspora groups and after the end of militancy in Punjab in the early 1990s, they have set up separate political organisations. Their fund raising now goes towards supporting these organisations, especially those that propagate a human rights agenda or greater participation in hostland politics. So there may well be some diaspora funding going towards political parties in Punjab but they are likely to be for those espousing the Khalistan cause. Coming now to the question of the Aam Admi Party, especially its spectacular success in Punjab where it gained 4 MPs in its maiden election, my impression is that there was little Punjabi diaspora funding for it – it’s success was more to do with the electorate teaching both the Akali Dal-BJP ruling alliance and the Congress a lesson for their general indifference and economic mismanagement. The strategies used by AAP in its successful election campaign in Delhi, especially the use of the social media, were also used very effectively in Punjab which took everyone by surprise. So although there is evidence that the AAP received funding from Indians abroad, I must admit I saw little evidence of open support for the AAP among the Punjabi diaspora in Britain. But their success in Punjab remains bit of a puzzle and we can’t totally rule out Punjabi diaspora funding – it is an issue which merits further enquiry. Prof. Shinder S. Thandi is Principal Lecturer in Economics and past Head of Department of Economics, Finance and Accounting at Coventry University. His teaching interests are in the areas of Development Economics and International Business with special reference to Asian Emerging Markets, especially India and China. 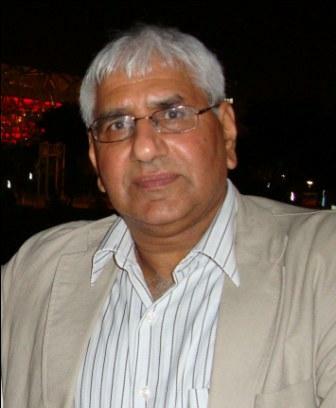 He has published widely in the area of Punjabi and Sikh migration and Diaspora issues in the UK, especially on different dimensions of diaspora-homeland relations. He has authored several papers on the potential impact of remittances and diaspora finance on aiding development. He is the founder member of the Punjab Research Group and founder-editor of the Journal of Punjab Studies. He is co-author (with Michael Fisher and Shompa Lahiri) of A South Asian History of Britain: Four Centuries of Peoples from the Indian Sub-Continent, (Greenwood Press, 2007). He has also co-edited two books: Punjabi Identity in a Global Context [ed. with Pritam Singh) (New Delhi: Oxford University Press, 1999) and People on the Move: Punjabi Colonial and Post Colonial Migration [co-edited with lan Talbot] (Karachi: Oxford University Press, 2004). He is currently working on a book on the Sikh Diaspora.